The Books by Jack the Lizard are on Sale!! The book is available for download on your iPhone, iPad, iPod touch, any other e-book readers and on your computer. 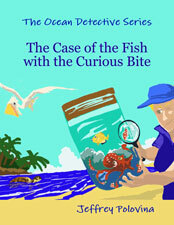 "The case of the Fish with the Curious Bite"
Alexis is an Ocean Detective Agent. One day, Jake, a fisherman, visited her with a fine tuna with several circular shallow holes. Alexis starts her investigation to find out what has happened to the tuna. She asks her friend Hector the dolphin. Surprisingly, Hector says that he has the same experience that something has made a nasty bite and left a hole on his body just like the one on the tuna. It seems the mysterious creature is hiding somewhere close in the sea. What kind of creature is responsible for those nasty bites? Alexis goes to the ocean to find out. What will she encounter and can she solve this mystery? More books by Jack the Lizard are on sale!! Click HERE!! Giant Panda, Dolphin, Koala, Penguin, Water Buffalo, Coral Fish, Jaguar, Orangutan, Giraffe, Lion, Hippopotamus, Hercules Beetle, Fossa, Great white shark, Pronghorn, Sea otter and more. T.rex, Stegosaurus, Tarbosaurus, Einiosaurus, Dromaeosaurus, Pachycephalosaurus, Allosaurus, Spinosaurus, Tylosaurus, Smilodon and more.